Stunning lab created diamond studs featuring gorgeous halos of man made diamonds. Ada's single halo studs can be made using center diamonds ranging in size from 0.5ct-4ct each. Available options: platinum, 14k or 18k gold: white, yellow, rose. All of Ada's bespoke fashion pieces are custom made to order with diamonds hand-selected for quality, fire, and brilliance. Ada Diamonds Design Description- These sophisticated stud earrings feature beautiful lab grown diamonds accented by surrounding halos, with customizable diamond sizes ranging from 0.5ct to 4.0ct. Available in 14kt white, yellow, or rose gold settings. 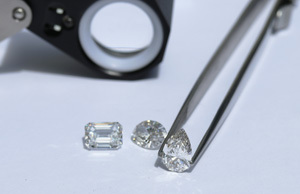 Starting at pricing for studs assumes a matched pair of GH, VS2/SI1 lab grown diamonds with GH VS lab diamonds set in 18kt white, yellow, or rose gold. Additional setting fees for 18kt: $150, platinum $300.